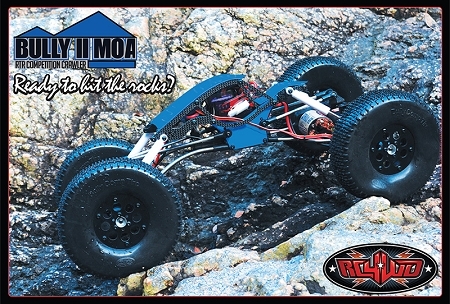 The MOA features the popular RC4WD Outcry II Waterproof ESC with built-in drag brake and a separate 6V 3amp Turbo BEC to provide reliable and constant power any time you need it. What an amazing entry in the comp crawling world, never before has any company offered such a complete, well thought out RTR. Some of the best names in crawling have been collaborating since the Bully 2 axles came out to fill a void left by the competition and they really knocked it out of the park! If your trying to get started into MOA but don't want to dive into the huge investment this is a great way to start. Out of the box you get a fully working MOA crawler. With a few tweaks and upgrading the servo this crawler does have the ability to take the top spot at a comp. Very impressed! Great RTR right out of the box! Headline says it all. You really can't ask for more out of an RTR. Good machining, and craftsmanship. Not disappointed one bit. Thanks RC4WD!